The Gay Gamer: More like Rainbow Tengoku, amirite? Before you ask, yes, this is the third post in a row that includes the word rainbow in the header. Also, no, that isn't an indication that this is "Rainbow Week" on The Gay Gamer. With that out of the way, let's move on to the subject of this particular rainbow-focused post: The art that will grace the cover of Minna no Rhythm Tengoku (aka Rhythm Heaven Wii) when it's released in Japan on July 21. I found out about said cover art yesterday morning after the folks at importer NCSX announced that they were accepting pre-orders for the TNX-developed title. I'd take them up on their offer in a heartbeat if: 1) They weren't charging just over $80 (not including shipping) for the game and 2) If it hadn't been announced--during the recent E3 event--for North American release. Will the art that appears on the cover of the US version of Minna no Rhythm Tengoku be as colorful as its Japanese counterpart? I sure hope so. That said, I wouldn't mind at all if Nintendo of America's designers got rid of those odd-looking alien people parading across the bottom of the box before the game hits the streets in the states. Yeah, I'm kind of with you there. 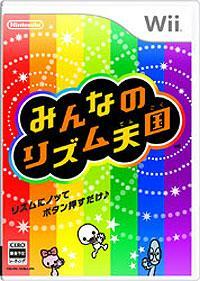 Honestly, a simple rainbow box with the Rhythm Heaven logo on it would be nice. If they got rid of the white swirlies, I'd be happy, too. Wasn't the DS version box in the US almost identical to its Japanese counterpart? Either way, this is one hell of a colorful cover I can totally dig. I kind of like the white swirlies, Justin, although I wouldn't be crushed if they were removed, too. Or maybe the designers could remove just some of them? Mark: Yeah, if I'm remembering correctly, the Japanese and NA art for the DS was pretty similar. Hopefully that'll be the case for the Wii version, too.